Your reading this because u want to see past the veil.. You know that the world built up around u is a lie!.. While everyone else smells roses u are the one that notices the stench in the air.. But u are not alone…. My friends, the ever increasing tyrannical oppressive authoritative police state regime has come to its precipice…. The Trespass Law, The FAA Reauthorization Act, The NDAA, The NDRP, FISA, SOPA, RFID chips…. We’ve been given the choice to either conform to slavery or die!!! (PLEASE CLICK HERE: http://12160.info/forum/topics/austin-70-year-old-navy-veteran-shot-and-killed-by-police-for)With the recent demand to disarm citizens this has become more evident than ever… We cannot afford to wait any longer for others to change things for us!.. We must change things ourselves!!!.. We must mobilize politically and restructure from within the corruption that has engulfed us.. This is your call to action!!!.. Please join me in my campaign to govern the state of California… I’m seeking any and all participants to stand with me in reclaiming our liberty… This will be a grassroots effort that will take the participation of many therefore I implore u to spread this message… Do not pass up this opportunity to stand on the front lines of peace keeping… Do not delay your chance to be a pioneer of a new beginning.. Do not wait any longer to experience freedom!!.. My name is Nickolas Wildstar and I’m running for governor of California!.. HOW TO START A REVOLUTION is the remarkable untold story of Nobel Peace Prize nominee Gene Sharp, the world’s leading expert on non-violent revolution. This new film (from first time director Ruaridh Arrow) reveals how Gene’s work has given a new generation of revolutionary leaders the weapons needed to overthrow dictators. It shows how his 198 steps to non-violent regime change have inspired uprisings from Serbia to Ukraine and from Egypt to Syria and how his work has spread across the globe in an unstoppable wave of profound democratic change. 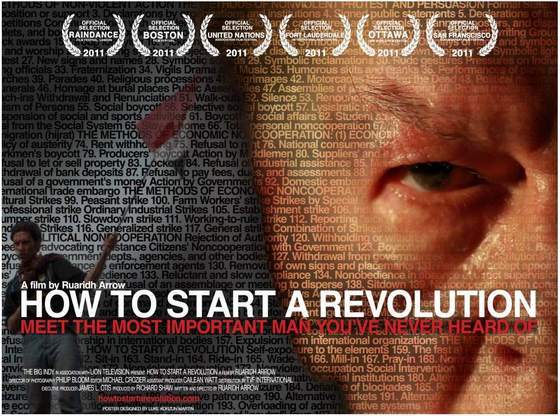 How To Start A Revolution is the story of the power of people to change their world, the modern revolution and the man behind it all. Hit the free like to the Albert Einstein Institution web page were you can get info on all of Dr.Gene Sharp work.